At the first annual “Think. Teach. Do. Showcase” on Thursday night, faculty and students in the Boston University School of Public Health presented their research in an effort to show the public the breadth of what people at the school do. 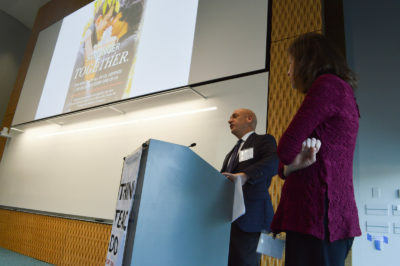 The showcase, which had over 100 people in attendance, reflected SPH’s core values of conducting research, providing education and engaging the public health community, according to SPH Dean Sandro Galea. Galea wrote in an email that the school organized the showcase, which was held at the Rajen Kilachand Center for Integrated Life Sciences and Engineering, to promote the work of the public health sector. More than 20 speakers from SPH — including faculty, staff and students — presented on a variety of subjects ranging from global health issues to rodents carrying diseases in Boston. The showcase was split into three segments: think, teach and do. Many presenters expressed gratitude for the various grants that helped them pursue their advanced research, one of which was SPH’s own Pilot Awards Program. Jessica Leibler, an environmental health professor, spoke on the fund’s impact on her researching involving animal-to-human disease transmission. “What’s been so exciting about this pilot fund has been the ability to really take a very kind of novel and unusual hypothesis into the field, which is not something we would have been able to do without this funding source,” Leibler said during the presentation. Kaitlyn Berry, a global health research fellow, talked about how public health can also focus on learning from and improving systems that are already in place. During the teach portion of the showcase, master of public health student Alexis Gitungano shared his story of growing up in Burundi, which he said is one of the poorest countries in Africa. Gitungano recalled his mother’s efforts to keep his family healthy in Burundi, which he said ultimately inspired him to pursue an education in public health. “My mom couldn’t afford medical care. She had to mix yogurt, Coke, and tomato paste and told us to drink it so that we can get blood back,” Gitungano said to those in attendance. Showcase attendees expressed an appreciation for the brevity of each presentation and the wide range of topics each speaker covered within the three to five-minute time limits. Tara Young, an MPH student, said she enjoyed the event’s format. “I really liked … the bite-sized snippets of getting to see the broad picture of what everyone at this school is doing,” Young said. First-year SPH graduate student Aviva Gellman said the event allowed her to get an idea of what kinds of research were being conducted by the various departments within SPH. “You know as a student the insane amount of research that happens here, but if you’re in one department or another department, you’re very aware of what that particular department is doing, but this just highlights everything that’s going on at the school,” Gellman said. SPH alumna Mathilde Hutchings said events like these help her to stay connected with the school and network with professionals in the public health field. Hutchings also said she finds the research presented at the panel exciting for the field.